Maybe today the splendour of marble monuments, the cultural ferment, the linear continuity of the landscape, the artistic boldness and the spirit of the people do not shine as they once did. Maybe the Grande Bellezza has no choice but to watch from up high, to embrace us and protect us, to gently remind us of its existence to be close to us, whilst we consider it only a routine part of the scenery. So, over the course of millennia, it seems the gods have been kind to this land. Despite modern development, bureaucratic labyrinths, prohibitions, estimations, insensitivity, cunning and opportunism, nothing can collapse. Italy remains at the centre of the desires of whoever needs to be nourished, soothed, to feel embraced, or to “come forth to rebehold the stars”. Of anyone who desires flaming yellow plunged in electric blue, the gaudy green of cool forests; the soft and punctuated pink of fine architecture, the blinding white of slippery snow; the streaked and transparent grey of water in a lake. Carefully set down in the centre of a “small” sea, Italy has been gifted with all types of microclimate and land formations. A chemically varied land that can cope with many uses and crops, majestic volcanoes to the south, combed and rounded hills form the vineyards of the centre, rugged expanses of woodland spread like plaster over ridges, and glaciers and arabesque peaks carved by a whimsical hand to the north. It is an urban landscape that is home to more UNESCO World Heritage sites that any other country in the world: and each is different from the next, with a touch of originality that makes it unique and incomparable to any other. The “Journey to Italy”, even in times of crisis, remains a life experience. We can say without arrogance, but with the humility of the “blessed”, that in few other places can history, art, fashion, zest for life and human warmth mingle together so easily. The treasures of Rome, Venice, Florence, Milan and Naples; the remains of the Roman Empire; the light of the Renaissance in the hands of Giotto, Leonardo da Vinci, Brunelleschi and Michelangelo; the impressive manual skills of the weavers, potters, shoemakers and manufacturers. It is hard to find something that does not inspire real passion. And then there’s the food. No-one in Italy cooks just to eat. The objective is the make the ingredients, the palate and the earth sing. And the wine is not just a drink but a true philosophy concentrated in the juice of the grape, from the moment the fruit is harvested until the intimate apotheosis of the tasting. 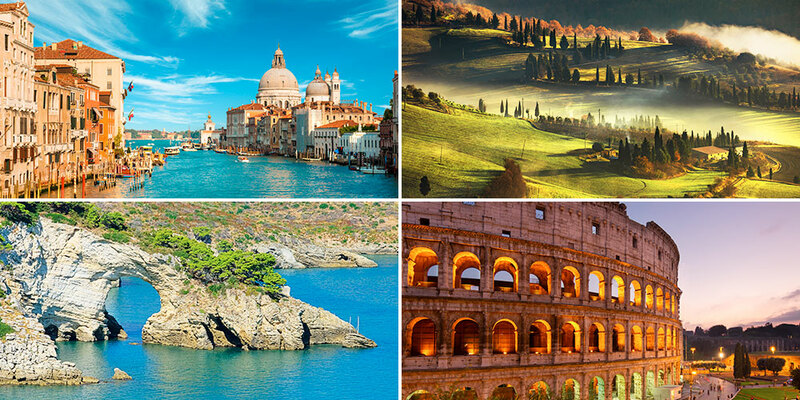 Italy that involves all the senses and all the body; sensual Italy. And Italy is also the cradle of the spirit of Christianity, in an often conflicting relationship between civil and religious, which is in the end tolerant and common in roots. As Ennio Flaiano wrote “We live – thanks to God – in a time without faith”. Italy is a land of pilgrimages, dotted with places of worship, from Saint Peter’s Square to the isolated and amazing hill hermitages, from San Francesco to Padre Pio of Pietrelcina. Nothing is missing. Only you are missing. Italy is waiting for you. TIME INCOMING SERVICE "only the best of Italy"